Participatory Public Performance: Bring your bicycles & your wildest butterfly costumes! Children welcome! Bike Route: We will ride together at a leisurely pace along the False Creek Bike Path, with stops along the way. *Please note that all times are estimated, and subject to variances. The total length of the bike ride is approximately 5.6 KM (30 minutes). OPEN INVITATION FOR PUBLIC PARTICIPATION. Bring your bicycles & your wildest butterfly costumes! Children welcome! How does art transform cities? How can artists activate public spaces? How can visual imagery invigorate the public’s creativity and imagination? 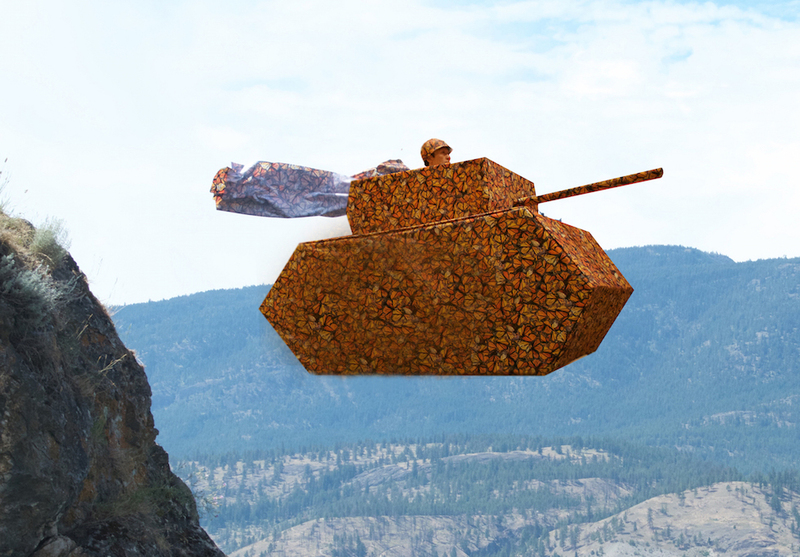 For March of the Monarch, David Khang creates a new public performance from recurring tropes in his art – monarch butterflies that camouflage a military soldier and his bicycle-powered tank. The public will be invited to form a “migration” of cyclists, and participate in a butterfly-themed bicycle ride through the city, accompanying the tank along False Creek, to Granville Island. Accompanied by the Korean music troupe Tazza, and with projected visual imagery as a backdrop, the audience will be invited to help release live butterflies. This multimedia project looks to engage the audience towards a social metamorphosis as part of Khang’s ongoing work of being open to change. The project is the last of a series of site-specific and site-responsive works produced by Khang over the past ten years as the Wrong Places Project and The Tank, The Poem and the Uniform. This multimedia project invites the audience to engage in social metamorphosis, by participating in Khang’s ongoing work of opening up to change. David Khang is a visual, performance, and biological artist whose practice is informed by education in psychology, theology, dentistry, and law. Khang selectively embeds these disciplinary codes into his work, to compose interdisciplinary languages that materialize in visual, textual, and spoken forms. In performing, Khang often embodies these languages to interrogate social constructions – of gender, race, and interspecies relations – that are present within dominant historic narratives in contemporary culture. By strategically employing non-native languages and code-switching, Khang produces divergent, dissonant, and often hyperbolic and humorous readings that re-imagine the poetic and the political. Khang received his BSc (Psychology) and DDS (Dentistry) from the University of Toronto, BFA from Emily Carr Institute of Art + Design, and MFA from the University of California, Irvine, where he was the recipient of the University of California Chancellor’s Fellowship. 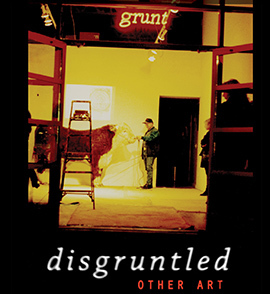 Khang concurrently completed UCI’s Critical Theory Emphasis, for which he worked with Jacques Derrida, Etienne Balibar, Fred Moten, and Laura Kang. In 2004, Khang’s thesis was chosen to represent UC Irvine at the Distinguished Master’s Thesis Writing Competition (USA). Khang was a 2006–07 recipient of the Franklin Furnace Fund for Performance Art Award (Brooklyn, NY), and in 2010, an artist– in–residence at SymbioticA Centre for Excellence in Biological Arts (Perth, Australia). Khang was born in Seoul, grew up in Toronto, and currently resides in Vancouver, where he has been dividing his time between art practice, part-time dentistry, and part-time teaching at the Emily Carr University of Art + Design. Khang is currently a JD candidate at Allard School of Law, University of British Columbia (2016–).